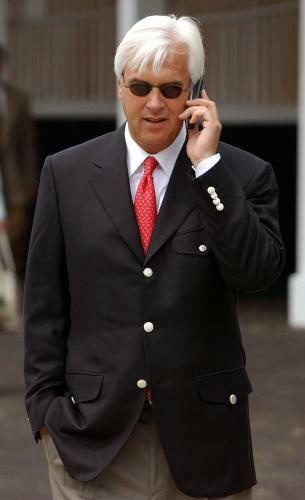 Over the years, Bob Baffert has trained horses for some of the richest, most successful owners in the business. When it comes to training their stock, these owners don’t just pick names out of a hat. Many of them got rich by operating large companies and by seeking out and hiring the very best people. I’m sure over the years, Baffert has learned to use his confident, yet reasonable demeanor to persuade owners that he is a better choice to run their stables than, say, Bobby Frankel, Richard Mandella or John Sadler. And it’s those very sales skills that Baffert needs to draw on Friday in Lexington when he tries to convince Garrett Gomez’ camp to choose to ride Pioneerof the Nile over Dunkirk in the Kentucky Derby. On Monday, Gomez’ agent Ron Anderson and Baffert exchanged several telephone calls and finally agreed to meet in Lexington Friday to discuss whether Gomez will ride Pioneerof the Nile or not, according to the Daily Racing Form. Baffert was going to Kentucky anyway to saddle Mythical Power in Saturday’s Lexington Stakes at Keeneland. Over the years, Baffert and Anderson have done lots of business together, as Anderson’s former client Gary Stevens rode Silver Charm and many other Baffert notables. But the Gomez-Anderson team also has a great relationship with Dunkirk’s trainer Todd Pletcher, who they have ridden many stakes winners for, too. Furthermore, Dunkirk ran a 108 Beyer Speed Figure in the Florida Derby on a dirt track, while Pioneerof the Nile has never cracked 100 in eight tries — all on either synthetic surfaces or grass. There’s a lot at stake on this decision for Baffert because Gomez knows Pioneerof the Nile, having ridden him to four straight graded stakes victories. Baffert likes veteran jockeys on his best horses and right now nobody is better than Gomez, who won the Eclipse Award as the nation’s top jockey for the last two years. Everyone knows that it’s late in the game, so many of the leading riders are committed to Derby horses. If Anderson and Gomez snub Baffert and choose Dunkirk, then who will Baffert turn to? John Velasquez is riding Quality Road, Rafael Bejarano is on Papa Clem and Joel Rosario will be aboard Chocolate Candy. Maybe Edgar Prado will be the choice, as his mount Imperial Council will not run in the Derby. Or Baffert may pick David Flores, who he’s had luck with in the past. Baffert will probably try to sell Anderson on his great record in the 3-year-old Classic races over the last decade or so. And it’s true, Baffert’s been the best: Silver Charm, Real Quiet, Congaree, Point Given and War Emblem, for the most part, all ran their eyeballs out in the Triple Crown series. The Gomez camp will have to make their decision based not only on the Derby, but the Preakness and Belmont as well. Anderson and Gomez will look silly if they chose wrong and watch either Dunkirk or Pioneerof the Nile win while they’re riding the other horse. Baffert, a finalist for racing’s Hall of Fame, is no doubt a great trainer. But on Friday he also needs to be a great pitchman.